This Guy is perplexing me. Hes pitched really well at all three levels of the minors that he has been at. Yet, he has zero stuff basically and his movement is average. Now his control is VERY good, so maybe that explains it...but does anyone think that would carry over to the WBL? I may bring him up just to see. His movement is decent, worst case scenario he's a reliever that dominates righties. He appears to be a nice #5. He's better than any of my pitchers. As of the first week of June, 2049, the Bulls sit in 2nd in the SL with a record of 30-22. The highlight of the season has been the starting pitching by Peppers, Schulz and Felizardo. Those three have carried the rotation as there has been turmoil in the 4 and 5 spots. Schulz is pitching the season of his life so far and Felizardo has really outperformed what even I thought he would do. I remember only two-three seasons ago thinking he would never make it to the big leagues because while his movement and stuff ratings were maxed out, his control was woefully behind. I'm not sure if the pitching coach worked on his delivery or what, but in one offseason his control jumped from 30 to 50 and he has been very good in the WBL ever since. He had a 3.30 ERA out of the pen in 89 innings last season. In his first chance to start this season as the Bulls' #3 pitcher, hes gone 4-2 with a 3.29 ERA in his first 10 starts. Its a testament to his work ethic that he went from having a potential 45 control in 2043 to maxing out where he is now with a current 55 control and pitching very well in the big leagues. On the other hand, the Bulls' bullpen has gone from the best pen in the league at the end of last season, to the absolute bottom of the barrel this season. Humphrey is the only one who has been consistent and the only one with a sub 3.5 ERA. It really is sad. I don't really have any bullpen arms waiting in the wings that are better either. I just gotta hope that they'll turn it around. Have Yourself a Week Mr. Chavez! He compiled a .409 average (9-for-22) with 7 home runs, 18 RBIs and 8 runs scored. The best part of the week was a 3 homerun, 2 walk, 10 RBI performance against Little Rock where he hit two 3-run homers and a grand slam before the 4th inning was completed. In 2049, the Bulls lost in the South League Championship Series to the Buenos Aires Gauchos in 5 games. So far in 2050, the Bulls have led the South League from week 1. As of the All-Star break, they have a 5.5 game lead over Buffalo and a record of 52-35. Miguel Chavez has spent a majority of the season on the DL. He has come back in the last 3 weeks though and shown that he is still true to form...as long as he can stay healthy. The Bulls lost SP Geiler Schulz to free agency in the offseason and replaced him with John "Rainmaker" Haney. Haney isn't having the season that Schulz had last year, but he has been very solid for the Bulls. The Starting pitchers all started out quite shaky but have actually had a marvelous summer. Hud, Haney, Felizardo and Murta all posted sub 4.00 ERA's in June and are on that pace in July so far. Peppers Pasquet is having about an average season for himself so far but is leading this club. In latest news, the Bulls lost relief pitcher Kent Smith to a 10 month UCL injury in the latest sim. I really don't have a ton of depth at any of my positions, so his loss will hurt. Instead of calling up Evan Nuyten who has had his shot in the WBL and posted 6.00+ ERA's every time, I called up Steve Dent to take a spot in the bullpen and moved Raul Medina into one of my two setup positions. The Bulls were able to sign quite a few very good looking prospects in the IFA pool to begin 2050. Lucio "Tangles" Escamilla is the most heralded player and is already getting some swings in A ball as he has already turned 18. He shows the potential for 55-60 contact and 70 power while playing first or third base. Its doubtful he reaches that potential, but who knows. We also signed a couple of pitchers that i'm looking forward to see how they progress. I still have a couple of strong arms coming up through my farm system. Tristan Scheele will probably be the first to make it to the WBL, but Nicholas "Ratbreath" Pye and Jude Brayley have the most potential of the group. If my plan works out and they continue progressing, I should be able to have Peppers, Pye, Brayley and Scheele as my 1-4 in the rotation in 2-4 years. Could have a pretty solid rotation setting up. As long as they continue to progress and stay healthy. Neanderthal and Prophet have split the player of the week for the SL for the last four weeks between them, each winning it twice. Out playing my expectations for them. I think you are about where everyone thought you would be. I may not re-sign prophet after 2051 just to see what he could garner in the open market. swept in the first round by Key West. I predicted they would fall from grace, just expected it to be sooner. That series was about as bad as it could be. All-Everything closer Billy Humphrey blows an outstanding effort from Peppers in game 1. Then the bats totally disappear. I think Pinto was 0-11 in the series or something like that. Didn't help not having Childs or Neanderthal. Oh well...on to 2051. Ratbreath's updated ratings per my scout have me happy in the pants. 70/65/55 with 3 65+ pitches potentially. The Bulls suffered an insane amount of injuries during the season. The fact that they somehow were still able to hang on and make the playoffs was a miracle in itself. The Bulls finished with an 85-77 record. The only month they had a full compliment of players on their roster was April and they went 15-8. After that the injuries began flooding in and the Bulls would only have 1 more month over .500 for the rest of the season(August...16-11). Season ending injuries were sustained early to players like Felix Perez, Billy Humphrey and Jorian Volkers. Laoghaire Geeves and Peppers Pasquet were lost midseason for a month while players like Tony Rosales, David Lopez and Kevin McGuire were lost in the final 2 months of the season for the rest of the season. The worst of these has to be Billy Humphrey who tore his rotator cuff and will miss the first 2-3 months of next season as well. Hopefully it doesn't wreck his ratings. Kevin McGuire broke bones in his elbow and will miss a couple months of next season as well. The injury bug bit hard this season, and it hurt. In the end, the Bulls were ousted from the playoffs in 4 games by heavy favorite Buffalo. Buffalo is stacked and they have a couple old Bulls as well. Superstar Miguel Chavez was traded earlier in the season and has had a very solid season for the Murricans. He was traded mainly because of his injury status and his contract running out next season. Aidan Davies had another great season but his contract runs out after this season and he was wanting $20 mil per season, so thats why i went ahead and traded him. So what do we have to look forward to in 2052? Well, looks like we're gonna be hoping to hold onto the back end of the playoff picture again with basically the same roster and hope that injuries don't bite again. We will also be fervently watching some young studs coming up through the minors that will infuse some much needed talent over the next few years. The rest of my prospects are really young guys that i'm excited about but don't have the potential of these top 5 guys. The guys above will be expected to be difference makers at the next level for me. There are others in my system like SS Giovanny Lucci who is an absolute beast defensively (70/70/80/70) with 55/55/30/45/45 bat potential. With that defense, i can take his bat being like that. Or OF Jack Tongue who shows potential for a 55/60/60/45/60 bat. I also have a slew of young pitchers that will need some years to develop that should be nice contributors for me in a few years. So while the big club has taken a bit of a step back this year and maybe next, we've got some folks coming that will hopefully help. 1-15 - SP David Pickett - Three 60+ potential pitches. 60%+ groundball. Needs better control. Reminds a lil of Abdul-Jalil Hud. 2-14 - 1B/DH Rabi bin Abdullah - 65 Potential power. 50's at all other ratings. Not great defense. 3-14 - OF Fabian Kamrk - 50+ at all batting ratings. Needs to improve defensive range. Great arm/errors. 4-14 - CL Abdul-Muhaimin bin Murtadi - 65 cutter/75 curve. Control must improve. 5-14 - SP Pepe Quintanilla - Has great movement on his stuff. Needs better pure "stuff" and better control. A good project. OF Tomas Gonzalez - 2 years, $3 Mil - Needed some corner outfield help. Gonzo will provide some extra power. Wanted Amati. I got screwed up and missed a sim. The low work ethic is kind of scary, but occasionally those guys pan out. Yeah, octavio caniliac's personality thing in sim basically says he doesn't do what his coaches say but his potential has soared. 3 weeks into the season. Pasquet and Pye are struggling, but the rest of my pitching has been pretty dang good. Offensively, i'm having trouble scoring runs but i'm getting guys on base and feel that I have a lineup capable of scoring runs. Overall, this is prolly the weakest team i've had in quite a few seasons, but I think they can battle for the bottom end of postseason eligibility. I'll feel more capable of being a stronger team over the next couple seasons once I add players like Caniliac, Alvarado and Brayley to my base team. Mid June and the Bulls sit at 31-34. The pitching is starting to come around as Peppers, Ratbreath and Hud have really turned it up over the last month. Lost John Haney for the season and Anier Murta was moved to the bullpen. Tristan Scheele is getting starts as my #4 while Steve "Harvey" Dent holds down the 5 spot. Billy Humphrey has returned from his extended stay on the DL with a torn rotator cuff. His ratings dropped a little, but so far hes pitched decently. Hope his ratings rebound a little as he gets back in the groove. That happened with Hud after he ripped his arm apart. He struggled, his ratings dropped and then he got himself back together and his ratings came back a bit. My young prospects are tearing it up in the minors. Felix Alvarado is close to a call up. He started out rough in his first season in AAA, but man hes really started to hit over the last month. I would like to try and save him for September call ups though as his ratings still have some room to improve. Jude Brayley has been downright dominant in AA. His last start saw him strikeout 13 over 6 innings and he has his ERA in the mid 2's. Should see a call up to AAA soon with a WBL ETA of 2053 possible/likely. Octavio Caniliac was out for a month with a broken rib, but returned hitting just as well as he was before the injury in AA. His ratings are AAA worthy, however he is just a young 20 years old. I'm not going to rush him. He could be a mid-year or September call up in 2053. Lucio "Tangles" Escamilla is doing alright in A ball. Hasn't shown the power I expect out of him. I've seen that most of my big prospects struggle in A ball and then really start to shine in AA...for whatever reason. I've got some relief pitcher prospects that I'm really excited about as well as some other starting pitching prospects who with a jump of 5 points in ratings in any specific spot could become really good prospects. One big transaction I've made is to trade young OF "Kevin "Spoon" McGuire to Little Rock for AA CF Guastao Branco. Branco is a legit defensive CF which the Bulls have never really had...only coming close with a year+ of Aidan Davies. If Branco can reach his bat potential, he will be a fantastic addition to my future OF. The way I see my OF in a season or two is Alvarado in LF, Branco in CF and Caniliac in RF. Alvarado and Branco are ++ defenders at their positions where as Caniliac will need some help. IF Caniliac doesn't improve on his fielding ratings anymore, I am not against moving him to 1B...which will be his likely destination once Neanderthal's contract runs out anyways. Bulls have had a rough last month and seen their record fall to 43-52. The offense has started to slide and my pitching just hasn't been good enough to cover that deficiency. I'm really not sure what I can do RIGHT NOW to solve the team's issues. I've got guys I could call up like Alvarado and Brayley. Brayley would solve my #5 starter issue while Alvarado might bring a lil more consistency to my lineup...but those are both MIGHTS and i'm not sure they would make that big of a difference right now. Neanderthal Geeves having the worst season of his career is really a downer. He has been the rock in my lineup. The one guy I can count on as a .290/.350/.460 guy his entire career. This year he is hitting an abysmal .229/.296/.325. I don't know if this is a down year or if age is catching up to him. His ratings are all still great, but I could see him just dying over the offseason. If thats the case, I'm gonna be in big trouble as I have him signed up for near 15 mil per year through 2055. The good news is 2055 is a Team option year for him...which i'm noticing while just writing this. So not as terrible as I thought it would be...but if he dies this offseason, i'll still have 30 million of dead weight for two seasons. I was hoping moving him to first base would prolong his career. I expected a decline into his 30's, but not this drastic. I'm hoping(praying) for a bounce back 2053. A big decision i'll have this offseason is whether to bring Hud back or not. He has a 6.8 mil team option. If I don't bring him back, i still gotta pay 1.36 mil plus whatever i would pay his replacement. Gonna have to decide whether or not I can find his replacement who will do just as well, but be cheaper. The good news is 1-4 of my rotation is pretty much spoken for as we stand for the next four years atleast even though all 4 pieces are not in the WBL at the moment. The way I see it you're gonna have 1 and 2 as Peppers and Ratbreath. 3 is going to be Brayley with Scheele pulling in at #4. Ratbreath, Brayley and Scheele will be on entry level contracts for a couple seasons while Peppers is signed through 2056. I'll be looking at Hud next season(maybe) or stop gap starters until I get some of my young guys coming up through the system to mature. My relief pitching has some help on the way. We just have to hold out for now. Frazer Wenden, who my scout loves with 70/60/55 ratings is a year out. Could possibly be in my bullpen in 2053. Christof "Viper" Utpadel and Abdul bin Murtadi are prolly 2 seasons away if they progress as they should. Then i've got a number of potential starters in my minors that could be used in the bullpen. The three linked, however, will be vital and go with Humphrey, Chavez and Woertgen to make a pretty good bullpen. My future outfield is basically set, with some caution. Felix Alvarado will more than likely set up shop in one of my corner outfield spots. Haven't made up my mind if i'm gonna give him some swings in September or not. I'm low on money this year so it will depend on how close I am to a playoff spot and if I have a legit shot or not. Guastao Branco will get some swings in AAA to end the season and will prolly be manning CF for the Bulls starting next year. Very Legit defender in CF which the Bulls have basically never had. The plan, for now, is to have Octavio Caniliac man the other corner outfield spot. That, however, is all dependent on a couple of things. First, will his defense continue to improve? As he currently stands, he could be an average corner outfielder. Extremely, Extremely average. However, with Alvarado and Branco being so good defensively, that may not be that big of a hindrance. If it doesn't improve any, and IF Geeves begins to die...Caniliac COULD see some extended time at 1B as well. His IF ratings aren't great, but they're ok enough for him to be ok at 1B I believe. The plan, however, is the have an OF of Alvarado, Branco and Caniliac by 2054. That would be a studly OF if they all reach the ratings my scout believes they will. As for my infield? Sheesh...i'm in trouble, haha. 3B is David Lopez'...for now. He is only signed through 2054. Chad Childs is signed through 2055 and while he CAN play SS...hes a much better 2B. The problem I run into there is that Tony Gonzalez needs to be in the lineup as well and doesn't have near the ratings to play SS like Childs. So Gonzalez will be at 2B. Geeves is my 1B unless he dies. Thu is signed for 2 more years(final year a player option) at catcher. So i've got some expiring contracts coming up with this group and i've got some mixing and matching going on. The worse news? I don't really have much coming up through the farm system. Lucio "Tangles" Escamilla has some potential...but only at 1B or 3B. I'm praying that he'll be ready by the time Lopez hits free agency so that I won't feel that loss as badly. Looking at his ratings and how he has progressed, i would think with two more seasons after this one that he would be ready. After that...my infield prospects are bleak as hell. Rabi bin Abdullah could be a guy that could see some swings at 1B. I'm hoping that Dobbe Pals' defense improves enough at catcher as I'm planning on him being my future starting catcher. Has the arm, has the bat(really good bat according to my scout) but his ability isn't there at the moment. Hoping it improves. Jesus Andres is the only thing resembling a decent bad from a middle infielder that I have in my system. I guess what I'm hoping is that some of my young pitchers pan out and I can trade one of them for a good young middle infield bat. There just aren't very many of those around, so I'm doubting there will be very many trade partners out there willing to give up a good young middle infield bat. I'm gonna have to try and target that in the upcoming drafts/free agency periods. i had typed up a long response, but the internets froze at work. Prospects Felix Alvarado and Guastao Branco will be making their WBL debuts this sim replacing Tony Rosales and Tomas Gonzalez who sustained multi-week injuries this past sim. 1-11 - SS Yakobo Osakwe - Legit SS. 70 range, 65 DP. Should turn into a very good overall player. 2.5-3.0* type guy that will play great defense and hit ~.250-.260. Prototypical SS. 2-14 - RP Vincent Lyons - Two 65 potential pitches with great stamina. Future middle reliever/setup man. Instead of reaching for a starter or a potential fielder, i went with a guy that I know I can use in 3-4 years. 3-14 - C Harrison Cashion - My scout likes him a bit more. 50 ratings across the board offensively. 70 ability with 50 arm defensively. My scout thinks he is almost fully developed. Could be my 2nd catcher this season. *More players were drafted but these are the only three I see, without major, major development, turning into WBL type contributors. C Francisco Miranda - One Year, $1.5 Million Contract - Upgrade at backup catcher. SP Daniel "Mauler" Salmon - MiLC - Top 75 prospect just needs to improve his control. Happy I could bring him in on a MiLC. INF Gareth Hesketh - One Year, $750k Contract - I didn't have a suitable backup at SS. Hesketh will get 15-20 starts this season at that position outside of injury...all against right handers. Kabul sent INF Giovanny Lucci to Istanbul getting OF Toby Eissens in return. Lucci looked like a burgeoning young prospect two years ago. My old scout saw him as a potential future starter. My new scout agrees more with OSA that there isn't much there besides defense. Eissens is a little younger and has improved in his potential since he first joined the WBL world. I will continue to keep an eye on him. I like Osakwe better than the dude NML drafted at #2. Osakwe was better according to my scout and it is nice to see OSA gave him a post draft bump as well. Solid pickup in an overall week draft. Well that was an unpleasant post. I meant that I'm getting broken image links. Too many beady eyed devils. Felix "Prophet" Perez hits homerun #300! Kabul finishes 1st in the South League 8n the 2053 regular season with a 103-59 record. I expected playoffs this season but not a 100+ win season. Hope we can carry momentum into the playoffs. Swept in the first round by eventual WBL Champions, San Francisco Tanners. Why did I want Spoon back on the Bulls so badly? My team is and has been really missing a leadoff type hitter. I have had Chad Childs in that spot for a few seasons and with his deterioration really becoming a problem this season, it has really become an issue for me. As well, Caniliac's defense has led him to be basically useless as an outfielder. Therefore the outfield of Caniliac/Branco/Alvarado that I envisioned will not come to pass. My plan is to have Caniliac as my every day starting first basemen starting next season which leaves a hole at one of my corner outfield spots. Bringing Spoon back should fill both of those holes for the next few seasons atleast. My outfield defense will also be really, really good once Alvarado comes back from his injury...if I can keep him healthy. Alvarado/Branco/Spoon are all 65-70+ at their positions. With as many "flyball" or "neutral" pitchers as I have, this is important. Bruin drove a hard bargain. I believe he knew how badly I wanted Spoon back and wouldn't back down. There were discussions about Tangles Escamilla however I was adamant about not moving my #1 prospect. In the end I moved Osakwe, Perez and De Vos. I feel Bruin got a great return for Spoon. Osakwe will likely be a starting level SS or 2B in the next year or two. I have two reasons why I was "ok" with giving him up. Number 1 is the fact that he has been dreadful in my farm system so far. Good news for bruin is that he is coming off of the best month as a professional. Number 2 is the fact that a combination of Jesus Andres and Juan Hernandez will likely be my middle infield of the future. Obviously everything is fluid but I have a couple pieces for middle infield which made me "ok" with moving Osakwe. I really like him though and expect he will be a good player for Bruin. Armando Perez is listed as a Top 10 prospect in my system however I don't value him nearly as much as that. He has a very average bat and is not good defensively. He is most likely a DH or first baseman and I have plenty of those types with better ratings/success in my system so moving him was an easy decision. Akke De Vos was a player that Bruin threw in at the end that allowed me to keep a draft pick. At such a young age, there is no telling what he will turn out to be. If he reaches his current potential he will be a decent #4 or so. I have a good number of pitching prospects in my system so losing a SP wasn't the worst thing. 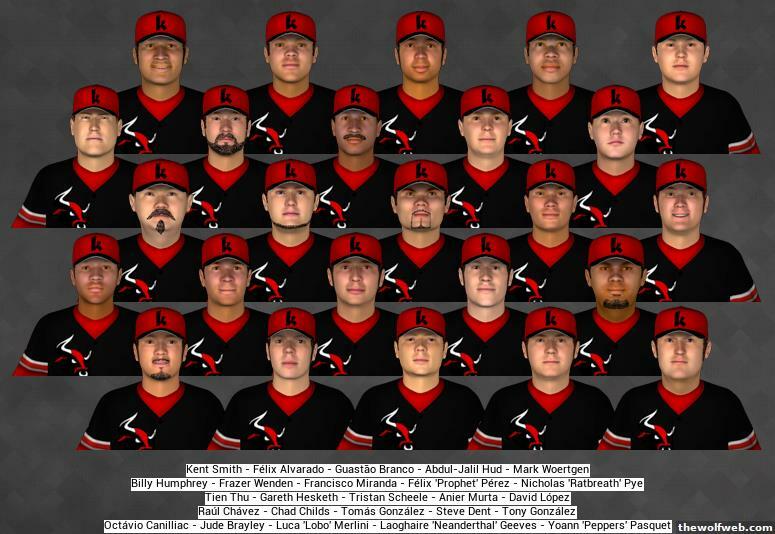 SP alone I have Ernesto Ramos, Luis Otero, Tony Silva, Kyle Matson and Beniamino Cacadino who all have the "potential" to be starters in the league one day. So losing De Vos wasn't the worst thing in the world. In my opinion, it was a pretty fair trade both ways. I got the instant help(hopefully) that I wanted and Bruin added some pieces to his farm system that he needs. I'll miss Osakwe and de Vos but you gotta give up to get. I just hope Spoon comes in and plays well. Spoon won Hitter of the week in his first week back as a Bull. He hit .560 with 4 doubles, 6 RBI and 2 stolen bases while scoring 8 runs...all in 5 games. Welcome Home Spoon! Rejuvenated by that famous Kabul air. Congrats to Tony Gonzalez, Octavio Caniliac, Juan Santos and Billy Humphrey on being selected to the 2054 All Wizard Game. Octavio Caniliac named MVP of the 2054 All-Wizard Game. He went 2-4 with a solo HR.